Cart and I will be going to Milan in November. Though Milan is mostly known as a fashion capital, we’d probably have to give that, as well as the Milan fashion week, a miss. We’ll be in Milan mainly because I’m a fan of the TED conferences, and to my pleasant surprise, I found out that there will be a TEDx at Lake Como. TED conferences are about sharing ideas on changing the world, and topics could range from technology to culture. Initially, these conferences are only limited to a select group, with entry fee said to cost a shocking 6 k USD and limited to just one thousand people, but thankfully it’s been opened for viewing online for the rest of us. By the way, if you havent watched any TED conference yet, do start with this one by Majora Carter about sustainable urban areas. I find it very inspiring! TEDx on the other hand is an independently organized events by communities to host a TED like event. It’s usually free, but it doesn’t mean that it’s less capable though. Ever since I’ve attended several independent talks in Singapore such as Interesthink, Nexus and Unconference, I’ve learnt not think too lowly of independent talks. 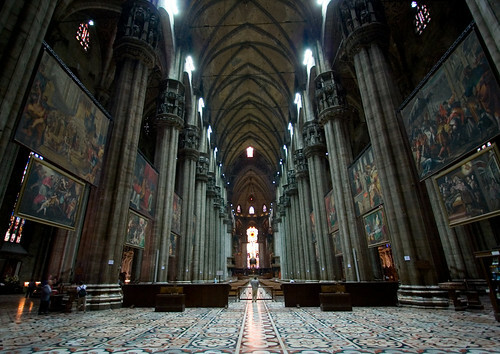 But apart from attending the TEDx, of course, I’m looking forward to exploring the rest of Milano. I’m sure there will be plenty of lovely things to see. Firstly the beautiful Lake Como, made very famous from Star Wars episode 2. Maybe we’d visit La Scala, which is said to be the most renowned opera and ballet theatre in the world. We probably wouldn’t be seeing Leonardo Da Vinci’s Last Supper. Even though it’s months to November, it seems that regular entry tickets are all sold out till January. The only tickets available are through agencies, which charges you 50 euro when it’s normally 6 euro to see a museum. But anyway, I’m sure that no trip to Milano would be complete without visiting the Duomo, one of the biggest cathedral in the world. Sidenote : Actually I’m also keen to visit Blogosfere, an Italian Blog aggregator, kind of like Ping.sg to see it behind the scenes. Waaaaahh!!! Lake Como!! If you see George (Clooney), tell him he still owes me one kopi. you definitely have to go to the top of the Duomo and have a look around. Regarding the Last Supper, you don’t have to make an advanced reservation if you want to risk it and also have time to wait. I went there without a booking and there was a queue of other people waiting to go in without a reservation too. What they do is they (VERY SLOWLY) let people like us in when a group or people who have booked don’t turn up. We waited under the sun for 3 hours but made it in. If you can’t be bothered to line up and wait or have time to do so, plan your next trip in advance and book early. I didnt know that you could do that, queue up in the hope that someone doesnt turn up. Seems quite risky though, having to wait for 3 hours. Its kind of like the colosseo, there is always a lot of people regardless of which time of month it is. Hey I’ll be going to Milan too but next week. Nothing too exciting, it’s a pain having to go there with the kids to make their passports. Is there a consulate in Milan? I wonder if it is bigger than the one in Rome. aw. next time then. from como, mendrisio is about 15 mins away by car and less than 10km by my estimation. btw, if you’re still looking out for tinted moisturisers, Olaz total effects has a nice one with a creamy medium tint and beautiful finish. Next PostNext I has a kitty bank!